Kidney disease progresses over time and a person’s needs change throughout the progression. Who is going to help you identify your resources as your needs change? Do you know your options for treatment if and when your kidneys fail? How do you maintain the hope to live the life you want? Nine years ago, Dorothy Bradley-Gonzalez’s doctor told her if she had her baby, one of them wasn’t going to make it. Dorothy had several health issues that made her pregnancy high risk, one of those being the threat of kidney failure, but she was determined to have her child. “God gave me my baby, anyway,” she said with pride. Yet, her kidney disease journey had just begun. Since that meeting with her doctor, Dorothy managed to keep her glomerular filtration rate (GFR), or kidney function, around 22%. When a GFR drops below 15%, a person needs to begin preparing for a kidney transplant or dialysis in order to live. In 2015, Dorothy’s GFR started declining. She knew it was time to begin educating herself about treatment options for kidney failure. Her kidney doctor referred her to the local Reach Kidney Care program. There she met care coordinators, Karen Nugent and Kathy Searson, who began to teach her about kidney disease, diet, and treatment options that would fit her goals and lifestyle. “One of the best things about the Reach Kidney Care team is that they understood my thirst for knowledge throughout the entire experience,” said Dorothy. Meeting with the Reach Kidney Care team helped Dorothy to incorporate exercise and new recipes into her family’s life. As a person with kidney disease, she learned the importance of cutting back on foods high in potassium, like potatoes and milk. In November, her Reach Kidney Care team helped coordinate her access surgery. Dorothy understood that when the time came to start dialysis she needed to be prepared. She had a fistula placed in her arm for hemodialysis treatments. Soon after, Dorothy said she began feeling the effects of the kidney disease. When it became difficult for her to climb up and down the stairs in her home, she knew it was time to start dialysis. Dorothy began in-center hemodialysis at DCI Freehold in January 2016. After spending time on in-center hemodialysis, Dorothy began to re-evaluate her needs. She began thinking about the possibility of switching to home dialysis. “With peritoneal dialysis, I can go back to work and I can spend more time with my family. I can pack up my machine and fluids and travel again if I want,” explained Dorothy. After meeting with her two Reach Kidney Care coordinators again, Dorothy had a peritoneal dialysis catheter placed. Later this summer, Dorothy will begin her home peritoneal dialysis training, and eventually she will only need to commute to the clinic once a month to get her lab results. She is already planning a summer vacation in North Carolina to visit with her family with her new flexible schedule. 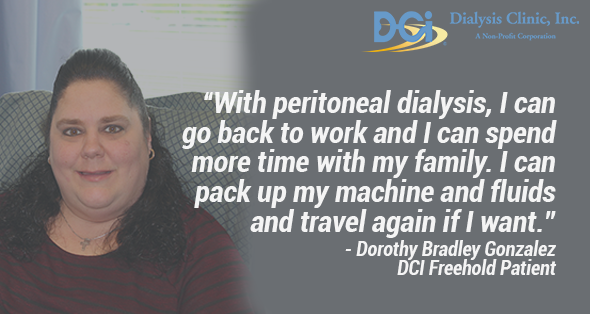 Peritoneal dialysis is not the last stop on Dorothy’s kidney disease journey. She views dialysis as a short-term solution and a kidney transplant as the long-term solution. The Reach Kidney Care team has provided education and support for Dorothy to become active on the transplant list. In less than a month, she’ll be officially registered on the national kidney transplant list. “I usually just share recipes on Facebook,” she said. “But lately, I’ve been thinking… I’m going to put my ‘ask’ for a kidney out there on social media.” She hopes that she’ll find a match on social media, because her husband and siblings are unable to donate to her. While Dorothy receives educational support from her Reach Kidney Care team and the numerous resources she’s found online, she also emphasized she receives emotional support from her family. Reach Kidney Care is committed to helping Dorothy live her best life. There are many treatment options for kidney failure. And, with a team to support you, there is hope for living the life you want to live.